Amazing is the experience of stepping off the plane in a foreign land. Though oftentime we miss some great stuff, as we are doing our best to drive on the right side of the road, let alone grabbing at nuance and experiencing the joy of a new and different place. Everything is different. Always on the run, rarely are we afforded the luxury of time to relax during travel. Briefly, we waft at the food and wrestle with language. We avoid the politics. We are wowed by the history, the age of the land and the Lore. We romanticize with foreign lands; like ships, we are just passing through. At best, if we bring back a solid memory, we've done good. This month, this holiday season, Tamara Giesberts brings foreign faire to Philadelphia. The Knapp Gallery is thrilled to share in some contemporary Dutch tradition. It has been a while since I’ve had to say the artist for my current show is not from PA., that I was not promoting a Philadelphia talent. This departure from my dogma is not without its costs. Fundamentally, though, it’s about the art, the talent and giftedness of an artist. After all, I am about my Gallery; doing whatever it takes to move it forward. Sure, holding the banner high for the cause of Philadelphia artists, as a c oncurrent endeavor, has significant value. My primary function as Director is to grow the Knapp Gallery. Acknowledgement is a dynamic thing. Now, I am free to exist in a space governed by “art for art” sake. Released momentarily from my pro “Philly First “mentality, I am caught up in the heaviness of Tamara’s imagery. I like it heavy, like being wrapped in a handmade quilt of emotion. Facts are facts. My emotional chord is my trigger. You get me through my heart. 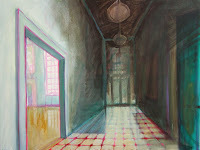 Another acknowledgement; straight up, I have to say, I could not turn away from these paintings. Immediately, I was taken with the overwhelming sense of desolation, the missing human element. 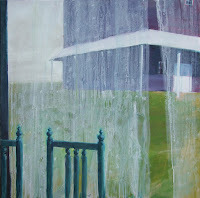 Tamara’s paintings strike a chord that visually articulates an emotional condition with which I am quite familiar. Certain boyhood memories come racing to the surface having seen this distinctive body of paintings. Her dark haunting images of vacant, dark and mysterious homes and houses, interiors and exteriors, conjure up latent emotional memories of my grandfather’s patriarchal home at 62 Ashland Avenue, in East Orange, New Jersey. An old three story home, “Six and Two” Ashland Ave., known for its dark hallway and stairs to the rear entrance of the kitchen, held secrets of the ages. Dark by nature, the house would talk to you. Listen closely, in the wee hours of the morning and you could hear the stories of my father’s youth. Tamara Giesberts’ paintings harness the power of memory. I’ve waited patiently to hang these paintings, believing the holiday season, when our dwellings are bursting with activity, to be the perfect time to unleash the profound, powerful and dramatic nature of Tamara’s work in My home is my Castle. Hailing from Amsterdam, the Netherlands, now residing in Fanwood, NJ, Tamara is a long way from home. A foreign trained architectural designer, Tamara transcends theory into art and demonstrates her painterly understanding of “the dwelling” with a profound confidence in perspective, line and light. Tamara’s ability to summon the tradition of Dutch masters’ depicting time of day by quality of light rounds out the resolution of this work. 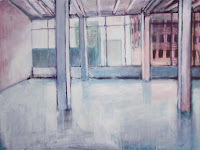 “Light typical for the weather and the hour of the present moment points to a context of ongoing time, subtly making temporariness tangible.” With a firm hand, Tamara leads the viewer around in her paintings. There are demonstrative triggers that she employs. Big on convergence Tamara leads you into her web turning you here and there, hither and yon. Remarkably, we can feel ourselves being manipulated. Bold vertical and horizontal line guide us like compasses. A near photographic depth of field, Tamara artfully waltzes us with color and stroke. Delicate in its dispatch, Tamara the technician unleashes raw emotion, some of it chilling. Technically perfect in perspective, Tamara’s tool box is deep. Above all things, she is the Queen of Light. Tamara’s genius is her instinctual and dramatic use of light. With fervor, Wyeth, Mondrian and Diebenkorn show up. Oddly enough, there is a smattering of Lichtenstein in The Projector. Like religion, there is always heavy light, light through windows, doors and veils. There is reflected light, from icy smooth and silky to some pasty. A master of emotion through light, Tamara massages her vignettes with identifiable moods. We are caught up in awareness. The overt shift away from human dominance dramatizes the environment; the dwelling and its bareness. Interestingly, Tamara identifies the Dwelling’s life by what we as humans have left behind, a "temporariness"she talks about. We are lost in the images. In our experiencing loss, we find ourselves. Simple.